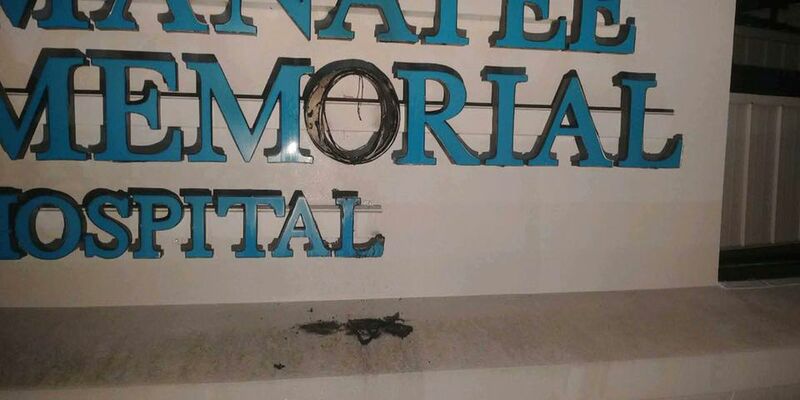 MANATEE COUNTY (WWSB) - A part of a sign caught on fire out of nowhere earlier this evening at Manatee Memorial Hospital. According to reports, fire crews arrived on the scene a few moments after the fire happened, around 7:15pm on Thursday. The letter "O" in the word Memorial is burnt out. Firefighters were able to keep the fire from spreading, using an aerial ladder to reach the sign, and only part of the sign was damaged. Electricity to the sign was turned off.